The Spanish Mackerel is a year-round resident in the central Gulf of Mexico. It forms predatory schools to feed, and its underwater mealtimes are often signaled by the presence of diving gulls preying on fish driven to the surface by hungry Spanish Mackerels. Spanish Mackerel fishing charters often look for this oceanic activity. Description: This predator has long body and narrow girth. Its back is markedly green, which fades into silver on its sides. Its most distinguishing characteristic from its Gulf-inhabiting relative the King Mackerel is a black marking on the front portion of its dorsal fin. The golden and olive-colored spots on its body remain as it ages. Size: The Spanish Mackerel is considerably small, rarely ever weighing over 12 lbs. It commonly weighs less than one-third of that weight at just 4 lbs. This species is short-lived with few mature fish over 5 years old. The Spanish Mackerel does not test high for mercury, and is, therefore, safe for consumption. While it is not the best for a main course, it is best prepared broiled or grilled. Location: Unlike its relative the King Mackerel, The Spanish Mackerel prefers near-shore waters, salty estuaries, and bays. The size of this species is often relative to the depth of water in which it was caught, with smaller fish typically found more inshore. 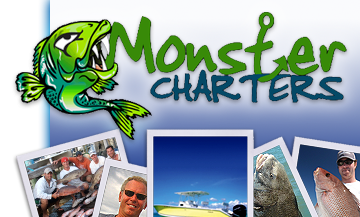 At Monster Charters it’s always the right season for a fishing charter. Contact us today to reserve a spot with a seasoned charter captain hooked on Spanish Mackerel.